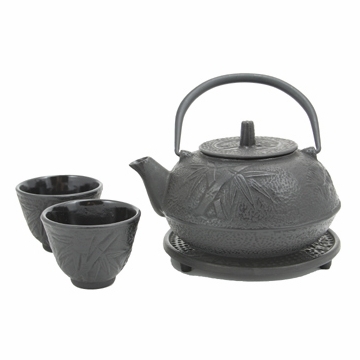 This high quality bamboo cast iron tea set is the perfect companion for enjoying tea. The bamboo design symbolizes the good characteristics of endurance and perseverance. This tea set is made from sturdy iron and has enamel coating on the interior to prevent rusting. Cast ironware heats evenly and retains heat well and is praised worldwide for their beauty, strength, and superb quality. Please note that this cast iron teapot should not be used directly on stovetops to heat water. It is good that it comes with two tea cups because you should always enjoy tea with a friend. Perfect size for single serving or tea for two! Makes a wonderful tea. This set is just the right size for me, and much prettier up close. I love it. This was slightly smaller than I had thought, but it turns out it is a god size for 2 or 3 people. When I have more people over, I probably need a bigger pot. It does keep things nice and hot! but is not yet opened. No Complaints regarding the seller. I ordered this tea set for my boss's birthday. She loved mine so much! The only mistake I made was in checking the size of the tea pot. This one was half the size of mine. Maybe a suggestion to somehow differeniate small and large tea pots. I consider it my mistake because it still makes a wonderful gift idea!